On this date in the year 96, the Roman Emperor Domitian was assassinated … his very last act in the purple having been to condemn to death an astrologer who predicted Domitian’s murder. Son and second successor of the Flavian dynasty’s founder, Vespasian, Domitian left his mark on Italian postcard stands by decorating the Roman Forum with the Arch of Titus to salute his older brother and immediate predecessor. Domitian, shall we say, set a low bar for the Antonines to step over by keeping the capital in a state of perpetual terror with wanton purges, not even excepting the sacred Vestal Virgins. As is usually the case with ancient scrolls, our lurid accounts rarely furnish convenient dates to later death-bloggers. Our excuse for this occasion will be the condemnation Domitian issued to a nameless astrologer immediately preceding his own fate; alternatively, we could cite the subsequent execution of Domitian’s assassins which was successfully demanded by the soldiery, who admired him. If this seems a cheat for an almanac site, consider that given a better documentary environment, the man’s entire reign would supply the execution-blogger a near limitless stock. Pretexts for these executions under Domitian were as varied and capricious as the killings were numerous. Many men and women alike among the wealthy were punished for adultery; some of these women had been debauched by Domitian himself. Many persons were also fined or put to death on other charges. Thus, a woman was tried and put to death because she had undressed in front of an image of Domitian, and a man for having associated with astrologers. Among the many who perished at this time was Mettius Pompusianus, whom Vespasian had failed to harm after learning from some report that he would one day be sovereign, but on the contrary had shown him honour, declaring: “He will surely remember me and will surely honour me in return.” But Domitian first exiled him to Corsica and now put him to death, one of the complaints against him being that he had a map of the world painted on the walls of his bed-chamber, and another complaint being that he had excerpted and was wont to read the speeches of kings and other leaders that are recorded in Livy. Also Maternus, a sophist, was put out of the way because in a practice speech he had something against tyrants. The emperor himself used to visit those who were expecting to accuse or to give evidence of guilt and he would help to frame and compose all that required to be said. Often, too, he would talk to the prisoners alone, while holding their chains in his hands; for he would not entrust to others the knowledge of what was going to be said, and as for the accused, he feared them even in their bonds. As a consequence of his cruelty the emperor was suspicious of all mankind, and from now on ceased to repose hopes of safety in either the freedmen or yet the prefects, whom he usually caused to be brought to trail during their very term of office. He had first banished and now slew Epaphroditus, Nero’s freedman, accusing him of having failed to defend Nero; for he wished by the vengeance that he took on Nero’s behalf to terrify his own freedmen long in advance, so that they should venture no similar deed. The historian Suetonius concurred that the emperor was taking Tiberius’s old turn into a paranoid old coot. He put to death many senators, among them several ex-consuls, including Civica Cerealis, at the very time when he was proconsul in Asia, Salvidienus Orfitus, Acilius Glabrio while he was in exile — these on the ground of plotting revolution, the rest on any charge, however trivial. He slew Aelius Lamia for joking remarks, which were reflections on him, it is true, but made long before and harmless. 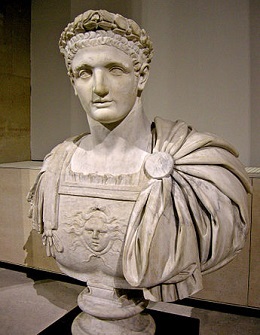 For when Domitian had taken away Lamia’s wife, the latter replied to someone who praised his voice: “I practise continence”; and when Titus urged him to marry again, he replied: “Are you too looking for a wife?” He put to death Salvius Cocceianus, because he had kept the birthday of the emperor Otho, his paternal uncle; Mettius Pompusianus, because it was commonly reported that he had an imperial nativity and carried about a map of the world on parchment and speeches of the kings and generals from Titus Livius, besides giving two of his slaves the names of Mago and Hannibal; Sallustius Lucullus, governor of Britain, for allowing some lances of a new pattern to be named “Lucullean,” after his own name; Junius Rusticus, because he had published eulogies of Paetus Thrasea and Helvidius Priscus and called them the most upright of men; and on the occasion of this charge he banished all the philosophers from the city and from Italy. He also executed the younger Helvidius, alleging that in a farce composed for the stage he had under the characters of Paris and Oenone censured Domitian’s divorce from his wife; Flavius Sabinus too, one of his cousins, because on the day of the consular elections the crier had inadvertently announced him to the people as emperor elect, instead of consul. Domitian also seems to have been extremely superstitious, even by Roman standards. Suetonius gets a little carried away here, enough so that it is impossible at 2,000 years’ distance to guess precisely where the embroidery was sewn to the facts; after all, Domitian’s subjects and observers were all superstitious too. It certainly makes a jolly good story. He tried to defeat the gods by having put to death an astrologer named Ascletarion, having first demanded Ascletarion’s prediction of his own manner of death: “that he would shortly be rent by dogs,” the oracle replied. To prove him wrong, Domitian had him killed some other way and immolated — but his satisfaction drained away when “it chanced that the pyre was overset by a sudden storm and that the dogs mangled the corpse.” Death closed around the prince, to his growing fear, and now he watched for the very hour. At about midnight he was so terrified that he leaped from his bed. The next morning he conducted the trial of a soothsayer sent from Germany, who when consulted about the lightning strokes had foretold a change of rulers, and condemned him to death. While he was vigorously scratching a festered wart on his forehead, and had drawn blood, he said: “May this be all.” Then he asked the time, and by pre-arrangement [of those conspiring against Domitian] the sixth hour was announced to him, instead of the fifth, which he feared. Filled with joy at this, and believing all danger now past, he was hastening to the bath, when his chamberlain Parthenius changed his purpose by announcing that someone had called about a matter of great moment and would not be put off. Domitian’s memory was immediately damned by the overjoyed Senate, which proclaimed as his successor an elderly placeholder named Nerva (who immediately canceled treason trials against this same Senate). Nerva’s line of adoptive succession (Nerva himself adopted the redoubtable Trajan) would rule that “happy and prosperous” Rome of Gibbon’s celebration for the best part of a century. * Cassius Dio wrote more than a century after Domitian. Suetonius and Tacitus are truer primary sources as both wrote their histories in the early second century, and both had themselves experienced life in Domitian’s Rome. Unfortunately the books of the latter’s Histories that cover the reign of Domitian have not survived to posterity — so from Tacitus we have only fleeting glimpses of the young Domitian aiding his father’s rise to power.